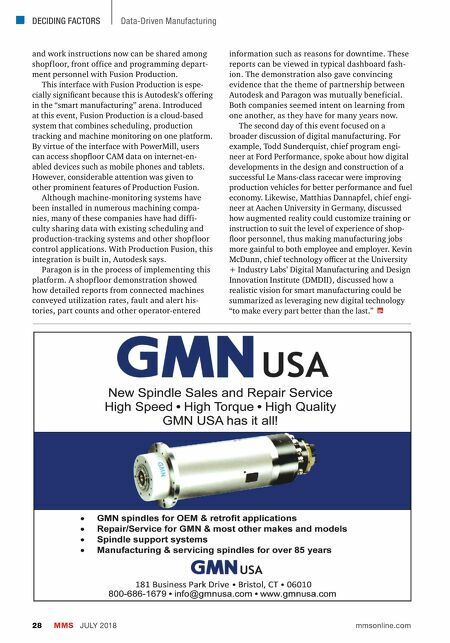 DECIDING FACTORS MMS JULY 2018 28 mmsonline.com Data-Driven Manufacturing and work instructions now can be shared among shopf loor, front office and programming depart- ment personnel with Fusion Production. This interface with Fusion Production is espe- cially significant because this is Autodesk's offering in the "smart manufacturing" arena. Introduced at this event, Fusion Production is a cloud-based system that combines scheduling, production tracking and machine monitoring on one platform. By virtue of the interface with PowerMill, users can access shopfloor CAM data on internet-en- abled devices such as mobile phones and tablets. However, considerable attention was given to other prominent features of Production Fusion. 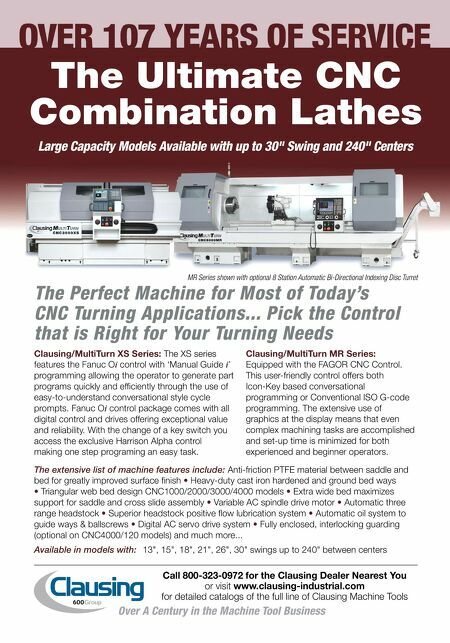 Although machine-monitoring systems have been installed in numerous machining compa- nies, many of these companies have had diffi- culty sharing data with existing scheduling and production-tracking systems and other shopf loor control applications. With Production Fusion, this integration is built in, Autodesk says. Paragon is in the process of implementing this platform. A shopf loor demonstration showed how detailed reports from connected machines conveyed utilization rates, fault and alert his- tories, part counts and other operator-entered information such as reasons for downtime. These reports can be viewed in typical dashboard fash- ion. The demonstration also gave convincing evidence that the theme of partnership between Autodesk and Paragon was mutually beneficial. Both companies seemed intent on learning from one another, as they have for many years now. The second day of this event focused on a broader discussion of digital manufacturing. For example, Todd Sunderquist, chief program engi- neer at Ford Performance, spoke about how digital developments in the design and construction of a successful Le Mans-class racecar were improving production vehicles for better performance and fuel economy. Likewise, Matthias Dannapfel, chief engi- neer at Aachen University in Germany, discussed how augmented reality could customize training or instruction to suit the level of experience of shop- floor personnel, thus making manufacturing jobs more gainful to both employee and employer. Kevin McDunn, chief technology officer at the University + Industry Labs' Digital Manufacturing and Design Innovation Institute (DMDII), discussed how a realistic vision for smart manufacturing could be summarized as leveraging new digital technology "to make every part better than the last."